Greensburg, Indiana, (population 10,260) was founded in 1822 by War of 1812 veteran Col. Thomas Hendricks. Michigan Road was completed in 1837, bringing more people to settle and visit the growing town. After the Cincinnati, Indianapolis, and St. Louis Railroad was completed in 1853, the town boomed. Agriculture, foundries, millineries, wholesale grocers, and other businesses took advantage of Greenburg’s strategic rail position. The economy of Greensburg continued to expand, with a global role as a leader in automotive parts manufacturing. 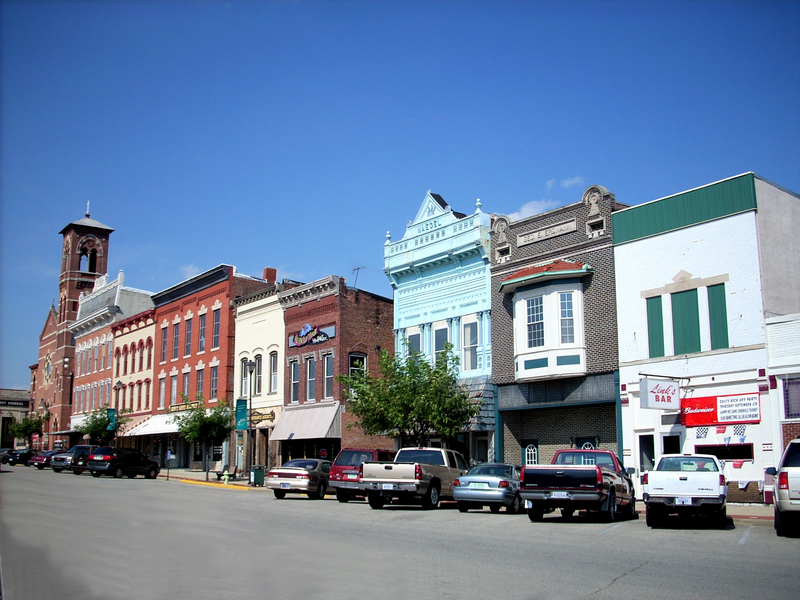 Greensburg has a central city square lined on all four sides by largely intact historic buildings. 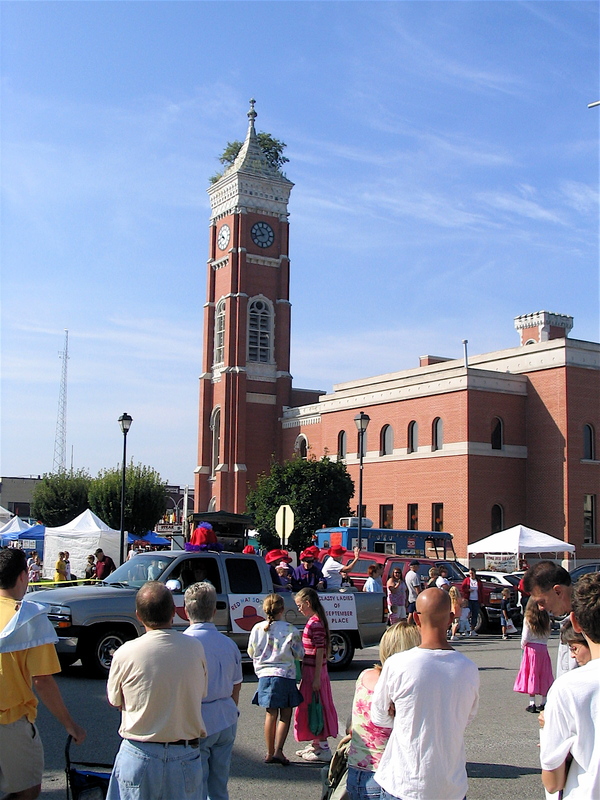 Similar architecture extends in every direction, which, with the county courthouse–famous for the tree growing from its tower–forms the Historic Downtown District. The Historical Society of Decatur County established a museum in 1976 in a historic former residence. The museum underwent an expansion and renovation in 2006, providing better facilities for storage, record keeping, and exhibits. Visits to the Historical Society Museum and a Pioneer Day event provide students an interactive learning experience on the life of the area’s first settlers. Another school enrichment project allows students to research historic buildings, focusing on the age, architecture, use and other information that would help place the structure within the community’s story. The results are then condensed onto bronze plaques placed on the exterior of the buildings. In 2006, Greenburg’s Main Street Organization, known as the Heart of the Tree City, helped establish the downtown district’s first façade improvement grant program. So far, eight grants have been awarded. Projects have ranged from replacement of an aluminum awning to complete renovation of an 1870s hotel on the historic square. Due to the program’s success, the city and the Heart of the Tree City received the Preservation Award for the Eastern Indiana Region of the Historic Landmarks Foundation of Indiana and had its program used as a template for surrounding downtowns. Greensburg passed a historic preservation ordinance establishing a Historic Preservation Commission. The commission is in the process of completing guidelines to protect building facades in the local historic district. In recent years, the county has participated in the National Underground Railroad Network to Freedom Trail, a federal project to connect historic sites, facilities, and programs associated with the Underground Railroad. Decatur County commemorates the story of escaped slave Caroline and the Greensburg citizen who assisted her family in their voyage north. A marker stands outside the courthouse memorializing the trial and another marker will be erected designating Caroline’s escape route. This project has reignited local interest in the Underground Railroad.